But what did the 600 million or so internet users in “China per se” think about the Met Gala? Armed with their ancient, mysterious language, I used my looking glass laptop to check out the conversation happening on Weibo. Mostly, Weibo users cared about the few Chinese celebrities who managed to escape the collective fantasy and attend the gala. The gala’s complicated Orientalist-flirting nuance got lost in translation, and many Weibo users (including large major accounts) were slightly horrified by how Americans perceived Chinese style. In other words, the Orientalism actually translated perfectly. 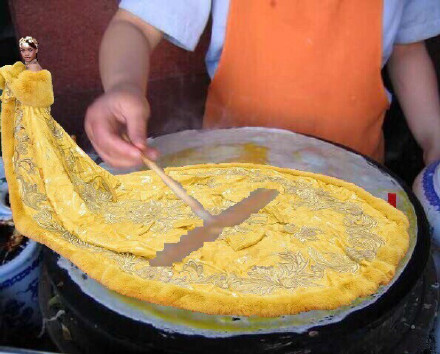 Weibo users applauded Rihanna’s choice of a Chinese designer (Guo Pei) for her dress, but there were also a lot of joking comparisons of her dress to an omelet or egg crepe (see pic above). 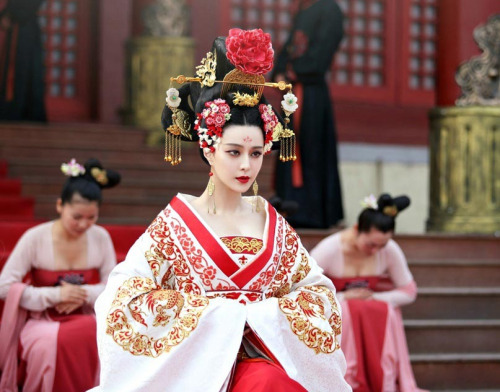 A lot of Weibo users declared that Fan Bingbing, who wears over 200 different elaborate costumes as Wu Zetian in the Empress of China, would have looked even better in the dress. But really, why are they competing at all? Clearly, they should team up and rule the world in fabulous dresses together. Fenty/Fan 2016 for real!